One of the worst experiences a person can go through is a burglary at home or at their business premises. Unfortunately even in our homes and office we cannot be sure that we are safe, and while we may have taken certain precautions to safeguard our house or premises, it is important to be on the lookout for certain signs. A burglar could be trying to tamper with your locks so as to gain access to your house. It could be that he may fail to succeed the first time round, but this does not mean that he will not be trying again in the near future. It is thus important to be aware of some of the most common types of door lock tampering so as to look out for possible signs of a burglary. When locks are tampered with there are generally some signs which will be quite evident. Other signs may be less obvious, but if you inspect your locks and keyholes closely enough you might be able to notice them nonetheless. Scruff marks especially near the keyhole area, and dents are the most common signs that there could have been lock tampering. This is the most evident form of lock tampering. When there is a forced entry there is often a mess. The burglar will have tried to use force so as to attempt to break in. The signs of force could be bashing the lock, drilling through the deadbolt, or simply kicking down the door. You might notice warped frames, wood debris, paint scratches, and bent deadbolts and latches, among other forms of damage. This is a less evident form of breaking in. Lock picking leaves very little, if any, signs and so you need to be trained to look for this form of lock tampering. When picking a lock, the burglar would have used small tools. This will generally be a pin, a dental pick, a flat screwdriver or something similar. Chances are you might notice some small scratch marks around the keyhole. The marks are generally fine as the tools used will have been small. There might also be some metal exposed around the key hole as a result of the tampering. 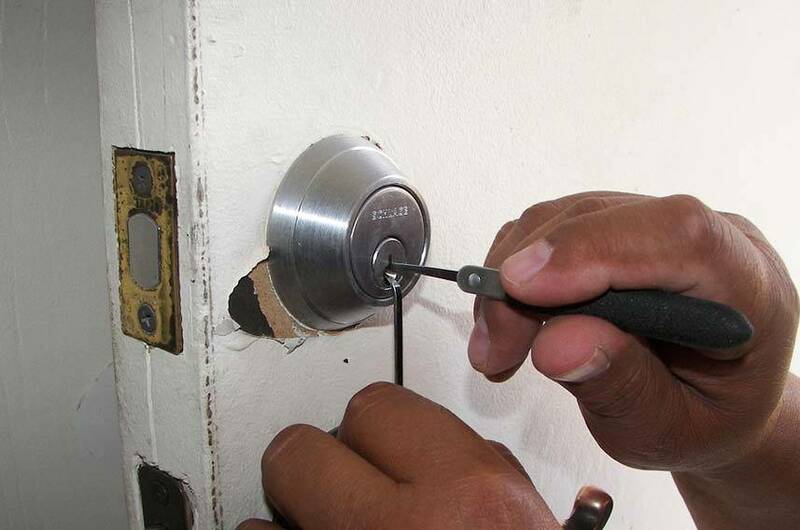 Lock picking is one of the oldest types of tampering with doors. With the small tool/s used the burglar would be trying to rake the pin tumblers so that once they catch the lock they will turn it and so the door will open. Lock picking is a discreet form of tampering and it does require some skill as well as considerable patience. The burglar will also need to have some time at his disposal in order to manage to complete the task. This is a method which will not involve the use of any special type of equipment. Many burglars make use of lock bumping to break in homes as it is a relatively fast and easy technique. Lock bumping gained popularity in the early 1900s. The main drawback of lock bumping is that it generates quite some noise, and so it may easily draw attention. Burglars will opt for this method if they know that there is nobody at home, and when there are no neighbouring houses. The teeth of a key are filed in different points until the key looks like a little saw. This ‘key’ is inserted in the keyhole and then removed by one click. The key is then hit using a blunt object. Once again, it is removed and the process is repeated until all the lock’s tumblers have been caught successfully. At this point the door can then be opened. With lock bumping the burglar will most likely leave signs such as nicks or shiny metal, particularly around the edges of the keyhole. There could be scratches that will have resulted from the pounding too. You may wish to note that there are bump-resistant locks which will offer protection against lock bumping. It is highly recommended that you seek professional advice on whether it is possible to upgrade your current locks. For instance, there are hybrid lock models which do not depend that much on pins and tumblers, and so it is much more difficult to tamper with them. You might also wish to add more security by installing a sliding bolt so that the deadbolt will not be turned even if it were to be unlocked. Locks could also be changed from time to time so as to improve your safety. It is also a good idea to consider installing a security system to monitor all possible entryways. Did you know there are three common types of lock tampering? Read our article about the most common types of lock tampering and ways to protect yourself.